While I agree with your personal characterizations of Palin, I can't agree with all of your political ones. As Newton Minnow once said about television, Sarah Palin IS the message. She is the personification of the false American dream that anyone can run for president, and as long as she can pull in large enough numbers to listen to her prattle about Russia on the horizon and the other 1001 Alaskan Nights, she will be in our faces every time she burps. She pulls in ratings, or else Rupert Murdoch wouldn't be spending so much of his money keeping her on the FOX staff. Those who are exploiting Palin, for whatever purpose, will continue to carry her as long as she's useful. Now that Bristol is "Dancing With The Stars", expect to see a great deal more of Mama Grizzly. For her camp, this is all no-cost win-win. For the American voter, there doesn't seem to be a win anywhere - especially not the Oval Office. We still lose no matter what happens. 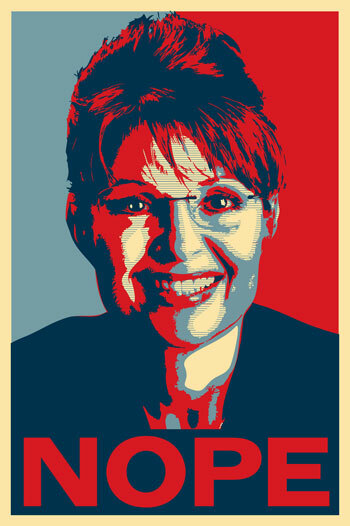 Sarah 'Bible Spice' Palin has been elected Queen of Idiot America by acclamation (sorry Michele Bachman and Ann Coulter). Meanwhile Beck seems to be increasing his lead over Limbaugh for the position of King. What is even more interesting about the Palin phenomenom is how willfully ignorant her supporters are. Sheep normally eat grass but in Palin Pasturers they are fed on pure BS and seem to thrive on it. The world that Palin and her sheep inhabit is like Bizarro land from the old Superman comics where everything is backwards. In normal countries the citizens elect the best and the brightest to lead them. In Palin Land 'dumb and dumber' are the criteria for leadership.